A 73 year old presents to ED with pain in his left femur. He has had assorted pains for some months and his GP ordered a Bone Scan which was done yesterday after a 6 week delay due to machine breakdown. He hands you the unopened Bone Scan. what type of the scan? It's a Bone Scan, I told you that already, but here you realise that it is a "super scan" as the kidneys cannot be seen. what is special about this scan? It's a "super scan" as the kidneys cannot be seen. the intensity of uptake makes the image very dark, so the technician turns down the gain on the image to make it look more 'normal'. In doing this, the outline of the kidneys fades. 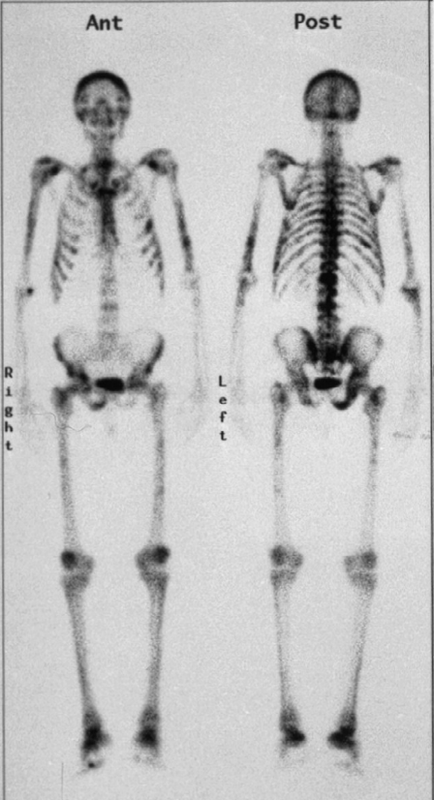 the amount of uptake by the bones means that little Technetium-99m reaches the kidney within the duration of the scan. If the scan duration was extended to 3 hours, the kidneys will be appreciated. given the opportunity to order ONE test, what will it be? I would order a PSA level as this appearance is characteristic of metastatic prostate cancer. if this test returns positive, what would you biopsy? If the PSA was greatly elevated, no biopsy is required. No other tumour elaborates PSA, and in this case a number of >500 would be expected. how would you treat this man? I would institute hormone therapy with a non-GnRH agoist which are associated with a tumour flare. A non-steroidal AR blocker like cyproterone or a GnRH-antagonist like degarelix would be appropriate with long term hormone deprivation. I would follow the PSA at 3 monthly intervals to nadir and then 6 monthly until pain recurs. I would then adopt a "spot weld" approach treating symptomatic metastases until PSA control is obvious lost. I would only consider regular bisphosphonates for patients who have real difficulty presenting to the Cancer Centre for radiotherapy, while the osteonecrosis of the jaw is not common, it is a disaster. The original data showing a 'benefit' for bisphosphonates, ruled radiotherapy for pain as a failure. Given that radiotherapy for prostate bone pain is generally successful, takes little time and is much cheaper than monthly infusions of bisphosphonates, I choose to observe patients. At that stage consideration of chemotherapy is warranted. if this test returns negative, what would you biopsy? If the PSA was not elevated, a biopsy is indicated. That would take the form of a bone biopsy if there were no soft tissue masses to be found. My second differential diagnosis would be male breast cancer, and as these are mainly Estrogen receptor positive, hormone therapy would be indicated.